The Kaivalyadhama Shreeman Madhav Yoga Mandir Samiti Lonavla popularly known as "KAIVALYADHAMA" is a voluntary body registered under the Societies registration Act, XXI of 1860 founded by Late Swami Kuvalayananda in 1924, primarily for promotion of research having scientific cultural and textual values in the science of Yoga. The Kaivalyadhama is in receipt of substantial financial assistance from the government of India as well as the State Govt. of Maharashtra, both for its maintenance and developmental expenditure. The Philosophico Literary research Department one of the Departments of the Kaivalyadhama and which is primarily responsible for compilation of the Yoga Kosa, is engaged in literary research work involving collection, compilation, investigation, analysis and synthesis of Yogic literature. The activities of the Department include inter-alia preparation and publication of critical editions with translation of old Sanskrit yoga texts and also reconstruction of Sanskrit Yoga texts from commentaries occurring in various other texts and commentaries. About two decades ago, under the able guidance of Swami Digambarji, the then Director of Research, Kaivalyadhama S.M.Y.M. Samiti, Lonavla had published Yoga Kosa Vol. I in two parts containing some 1800 entries from 30 texts. The procedure for explanation, that was adopted, was of giving not only the literal meaning of the words but to present a comprehensive information based on the reference and context of the terms. That Yoga Kosa was warmly welcomed not only by students and teachers but also by Yoga researchers. Inspired by this phenomenon, the staff members to the Philosophico Literary Research Department Of Kaivalyadhama undertook the explanation of Yogic terms and concepts from other Yogic texts. The Department scrutinised those texts also which were already consulted for the preparation of the first volume of Yoga Kosa and collected a few but important left-out words worth getting entry in the Yoga Kosa. 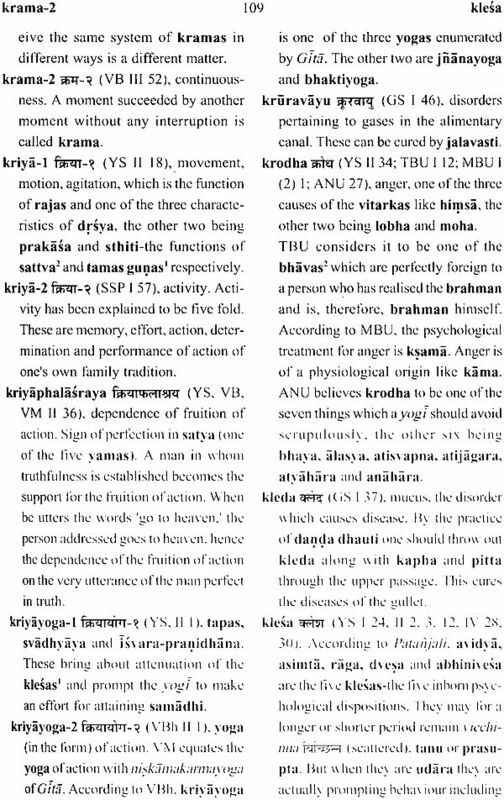 When the work was in progress, we thought that, since the previous Yoga Kosa proved its Yogic usefulness and was presently out of print, it would be proper on our part of combine it with the New Yoga Kosa, Accordingly, we re-arranged all the words in Devanagari alphabetical order and presented them in this form. The main procedure happens to be the same for both the Kosa. 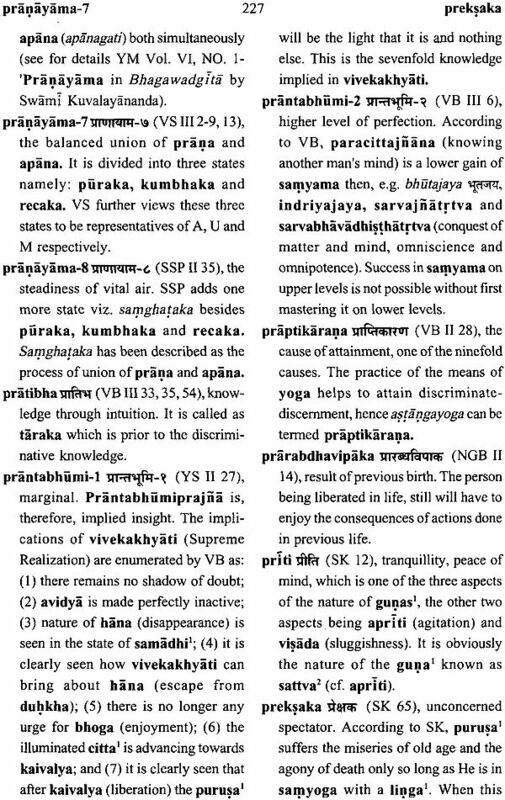 In all, some 3000 words have been explained on the basis of thirty seven Sanskrit texts on Yoga. We are really sorry to write that at the time when this work is being printed two of our earlier editors responsible for 1st Volume and New edition of Yoga Kosa-Rev. Swami Digambarji and Dr. Mahajot Sahay are no more with us. We are extremely sorry specially for Swami Digambarji, who left us in June 1990, who was really a source of inspiration without whom it became arduous task for us to complete the work. The Department pays its homage to Rev. Swamiji by way of publishing this Yoga Kosa We will remain ever indebted to him for his contributions. Kaivalyadhama S.M.Y.M. Samiti and particularly the philosophico Literary Research Department is highly thankful to Govt. of India, Ministry of Human Resource Development, for providing 80% financial aid to Kaivalyadhama for bringing out this Yoga Kosa for the cause of humanity in general and yoga in particular. The department is also thankful to Ex-joint Director Of Research, Dr. P.V. Karambelkar, Ex Principal, G.S. College of Yoga & Cultural Synthesis, Dr. M.L. Gharote, and the present Joint Director of Research, Dr. M.V. Bhole, for taking keen interest in the work and also for giving time to time guidance and valuable suggestions. We give our special thanks to Dr. G. Ramakrishana who took immense pain in going through the whole mss of Yoga Kosa minutely in order to make it more and more perfect both from language and content point of view. We also wish to express our appreciations to Shri. T.P. Sreekumaran for typing the manuscripts of Yoga Kosa at all the stage of its development with due precision and accuracy demanded of him. We express our feeling of gratitude towards all those who have directly or indirectly contributed towards its preparation or improvement. Last but not the least, the credit of printing this Yoga Kosa in such an excellent form without making any complaint against the editors of Yoga Kosa for the inclusion of a new sentences even in the final proof, goes to Model press. New Delhi and to Shri Manoj Talwar in particular, who so devotedly took keen interest in getting it printed. Finally, we hereby appeal sincerely for constructive and healthy suggestions from our esteemed readers so that we can incorporate them in our further work of similar kind. 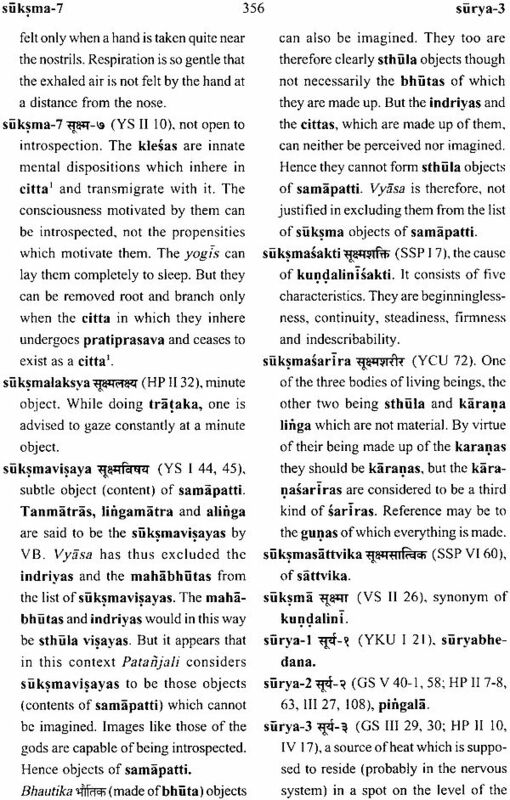 Before one actually starts referring to this kind of dictionary like Yoga Kosa, it is advisable that one must go through its 'Introduction' which is expected to unfold the scope and nature of such a dictionary enabling the reader to make its better use and understanding. About two decades ago Kaivalyadhama Yoga Research Institute had taken up a gigantic and prestigeous project of preparation of Yogic Encyclopaedia to be undertaken by handful of devoted and sincere Research Workers of Philosophico- Literary Research Department. 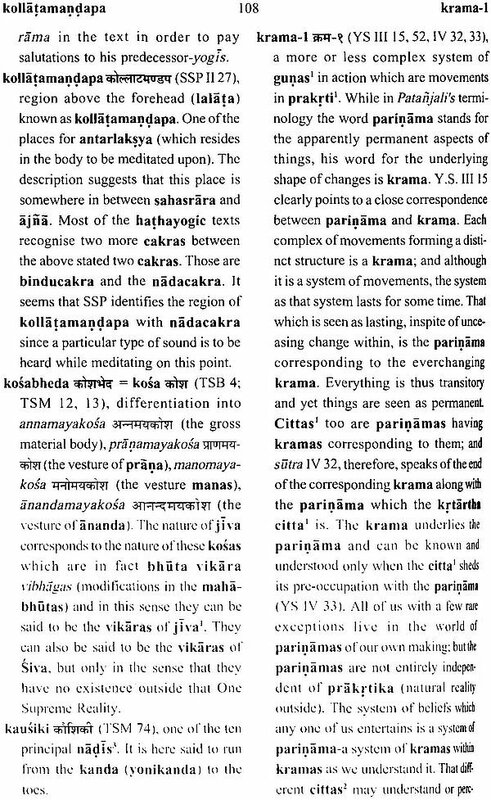 This Encyclopaedia was supposed to give A to Z information about various Yogic terms, concepts or techniques at one place. Even after our sincere efforts in the direction of preparing Yogic Encyclopaedia, it could not be completed because of several limitations. Meanwhile, this esteemed project was thought to be materialised by initially preparing Yoga Kosa so that we could give immediate results of the material collected for the said project and thus the present Yoga Kosa can be considered as an Encyclopaedia in the making. Most of the ancient Yogic literature happens to be in Sanskrit language. 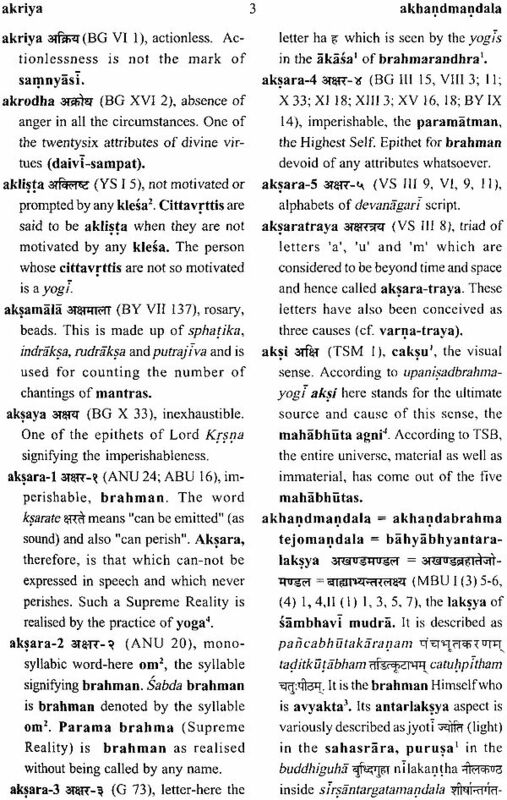 Though there are numerous standard Sanskrit-English dictionaries yet they are not sufficient to fulfil the demands of the readers who are desirous of understanding the concept of Yogic literature with their every minuteness. It is a well-known fact that dictionaries of Philosophy, Economics, Political Science etc., came into existence due to such a demand of the discipline even when the meaning of such words were available in general English-English dictionaries. And a similar need was felt with regard to Yoga. As Yoga is a well-developed sastra, the language used to describe it ceases to be ordinary Sanskrit language. 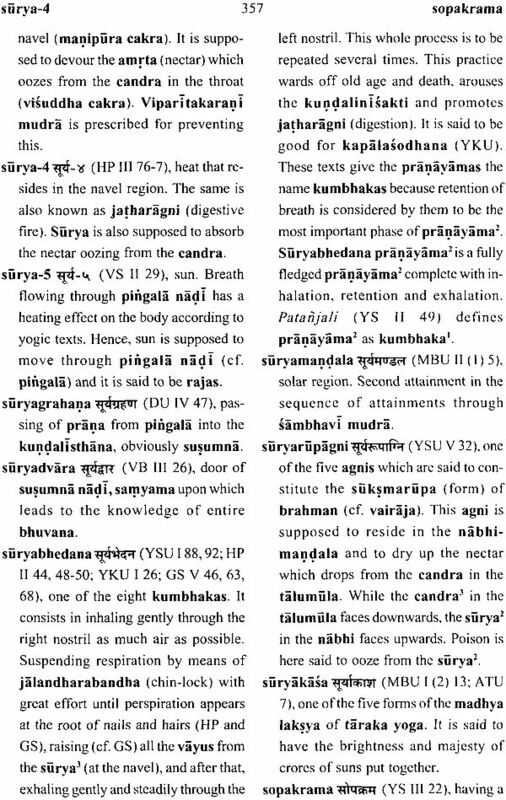 Hence the general Sanskrit-English dictionaries are of not much avail simply because of the very nature of such dictionaries. 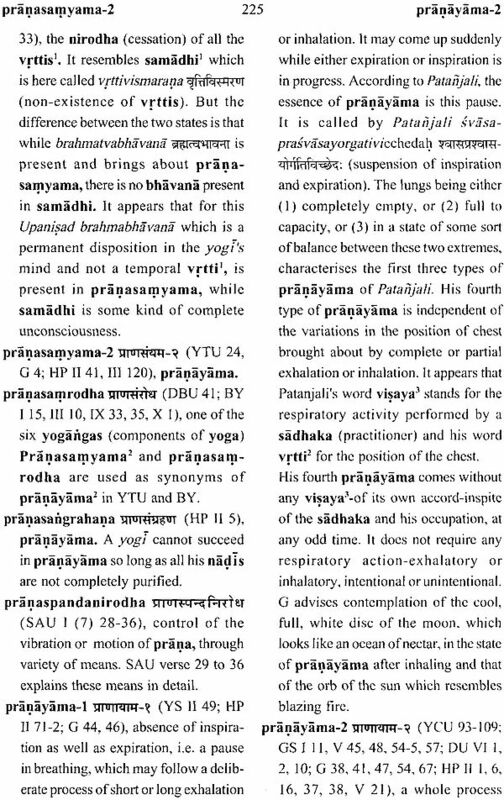 Therefore, the compilation of present Yoga Kosa, The words or terms used in any specific sastra will not yield specific connotation unless they are understood with reference to the context in which they are used. Hence the ordinary Dictionaries are insufficient. 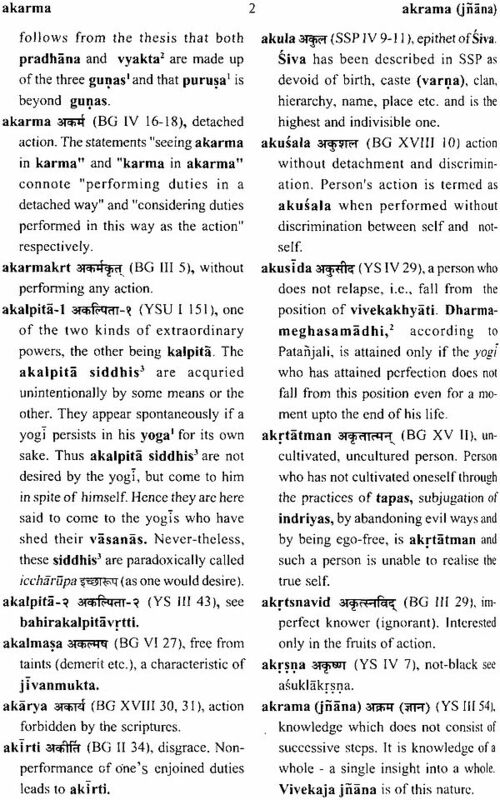 Having this in view, the present Yoga Kosa endeavours to give a comprehensive understanding of Yogic terms with the help of their reference to the context ofthe respective texts wherein they have appeared. It is hoped that this Yoga Kosa will provide sufficient, useful and consolidated information and understanding of particular concept, term or practice. A sincere effort, on the part of the editors of Yoga Kosa, has been made to provide the explanation based on the factual information available in the text. Even then as it happens in the case of any branch of knowledge, the understanding of the concepts and terms gets coloured by the interpretors' own understanding, Hence at certain places, where the editors have not accepted the traditional explanation of a certain term, they have ventured to give their own interpretation also without any iota of dogmatism or bias. 2. Commentaries on Yoga Sutra. In all we have consulted thirty-seven texts and though the words from them have been selected almost exhaustively but we have also evaluated the merit of the words depending on their Yogic nature and our understanding. Therefore, our sincere efforts will undoubtedly prove to be helpful to even a layman in going through the texts considered for this dictionary. The words selected for interpretation appear exclusively in bold letters in the 1) main entry, 2) the body oftheir explanation and 3) the explanation of other words. This will facilitate the purpose of cross-reference. 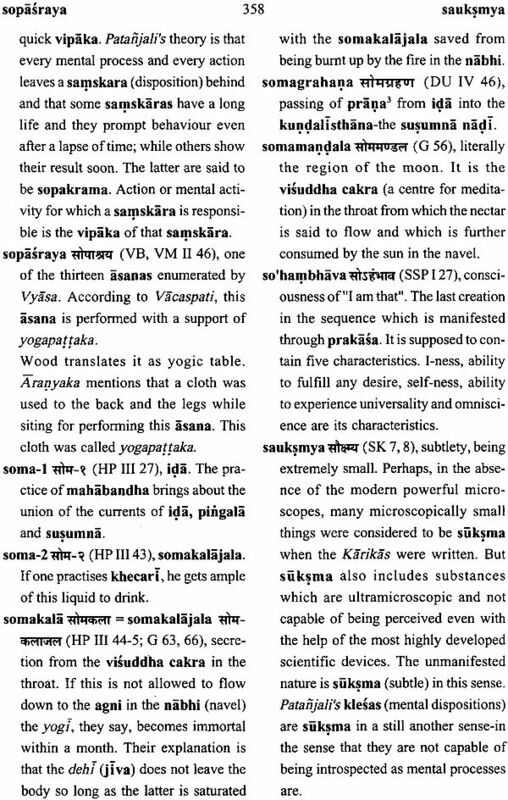 It was not possible to give the meaning of all the Sanskrit words or sentences used in our explanation, because of the problems of space and also of their general nature. Consequently, such words or sentences have been printed in Italics alongwith their Devanagari rendering. The main contextual explanation of the word is receded by the nearest literal meaning of the word. 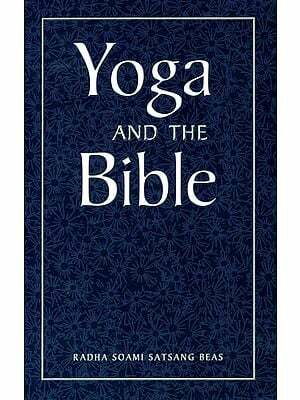 For the compilation of the present Yoga Kosa, we have primarily considered only those Sanskrit Texts which are traditionally considered to be Yogic Texts. 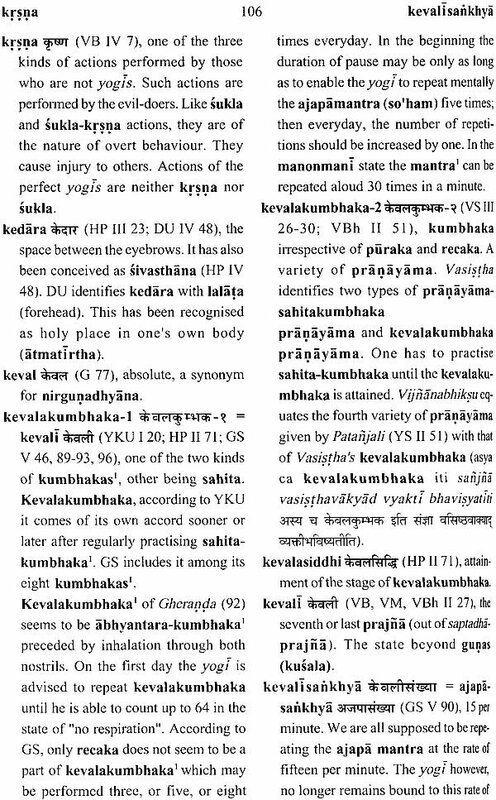 Other Sanskrit literature which is conventionally not considered as Yogic, nevertheless contain Yogic wisdom in-built in it, will be our concern for the next volume of the Yoga Kosa.